During my childhood, kids rarely had pocket money. If we did, a nickel or dime had plenty of purchase power, and comic books were in our price range. Historians of pop culture have labeled the 1930s-1950s the Golden Age of Comics, with the 1940s its peak. The first comic books, produced about 1933, were reprints of newspaper comic strips. These soon were replaced by original stories, illustrated with pictures, in a magazine about seven inches by nine with a glossy cover. Some subjects were popular with boys, some with girls, while others appealed to both. Boys liked cowboys and Indians, war, crime, horror, science fiction, Terry And The Pirates, and superheroes Captain Marvel, Superman, Batman, and the Green Hornet. Girls fancied Wonder Woman, Nancy and Sluggo, Little Lulu, fantasy, and romance (the latter two being pretty much the same thing for our age group). Both genders might choose Mutt and Jeff, Blondie and Dagwood, Archie and his pals, Disney characters, Tarzan of the Apes, and Ripley’s Believe It Or Not, to name a few. After a comic book had been read several times it lost its appeal. It was then that its owner entered the world of Comic Book Swapping. Condition was everything; a pristine copy obviously had more value than one that a younger sibling had been reading or the dog had tried to eat for lunch. It might take two or three tattered issues to equal a like-new edition. You had to know the territory. In my small town, the Kingpins of Comic Book Swapping were two sisters, Ramona and Judy, who lived down the alley from me. They must have had more comic books than any kid in town, probably more than all the other kids combined, maybe even more than Baxter’s Newsstand, which was barely more than a walk-in closet, with only a few shelves devoted to comic books. The problem with the girls having this private enterprise was that they most likely already had the comic I wanted to swap. My only chance was to get up at dawn, be on Baxter’s doorstep when a new shipment arrived, buy a comic book in which the ink wasn’t dry, read it right there, and then race down the alley to visit the czars. That happened only in my dreams, so I had to be content with the hand I was dealt—dog eared comic books. Ramona, the elder, was a year younger than me (but bigger), and Judy was a couple years Ramona’s junior. Judy wore a hearing aid and glasses and she had an obvious physical and intellectual disability of some sort, but she was no slouch at merchandising. For me, it was a lesson in humility encountering either girl, but they were partners, rendering them more intimidating. I was timid by nature, anyway. With barely a glance, I took the deal, grateful to escape from their den of thieves. Then, it often happened that on the way home I’d discover that I’d already read the comic in my hands. Oh, well, maybe I could swap it with someone who didn’t have the collection that Ramona and Judy had—which was any other kid in town. Decades later, four pristine issues of True Comics came into my hands. I began to fantasize that I walk into a comic book swap meet, and there they are—Ramona and Judy. Huddled between boxes, they look like those elderly hoarders we hear about and pity. I don’t pity these two. I stroll to their booth and place one of my perfect True Comics on the table, the other three copies clearly displayed in my hand. The aged partners study me and don’t recognize my face. They examine my offering and then look at each other, their secret language still intact. But I understand; they don’t have this vintage edition of True Comics and are lusting to get their inky hands on it. Judy wets her index finger and flips through a box. Ramona rummages in another, and another. Judy makes a selection and shows it to Ramona. 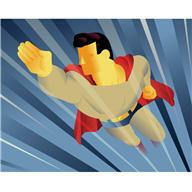 Ramona nods, and Judy offers me a glistening Superman, his muscled arm ending with a clenched fist aimed at me.